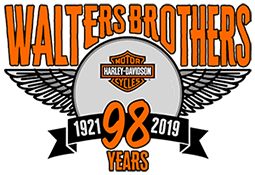 Walters Brothers sponsors lot's of Reasons to Ride your Harley. The HOG of Peoria Group is one of them! HARLEY® OWNERS GROUP OF PEORIA, INC.
Was established by people just like you - people who share a love of motorcycling, a passion for Harley-Davidson® motorcycles, and who want to share the fun and enjoyment with others like themselves. Join us as we carry on the wonderful tradition of riding Harley® motorcycles and sharing the fun with friends! Our chapter holds a variety of activities for its members, including overnight rides, day rides, and dinner rides. The members often plan group rides to national H.O.G.® events and to events held by other local motorcycle groups. Annual events include a summer mileage contest, a winter mileage contest, and a statewide poker run. A year-end banquet is held in the fall and awards presented to the winners. MEETINGS: 2nd MONDAY OF EACH MONTH AT 6:00 P.M at Walters Brothers for a short business meeting followed by a ride to dinner. Anyone applying for membership in H.O.G.® Club of Peoria must be a current national H.O.G.® member. Associate members of national H.O.G.® may apply for membership in our chapter as long as the primary member is also a member of the Peoria Chapter. Spouses/significant others are welcome to attend our chapter events with a member but are not eligible to vote on chapter business. Members are responsible for paying all event fees for his or her spouse or significant other. Non-members are welcome to attend two club events as a guest of a member. After attending two events, the non-member is asked to become a member before he or she attends additional events. Expired national H.O.G.®; membership automatically terminates local chapter membership. Anyone applying for or renewing membership in our chapter must provide proof of current national H.O.G.® membership. It is the member's responsibility to renew his or her national and local at the time it is due. Dues to our local chapter are $15.00 per year per member and can be paid at Walters Bros. Harley-Davidson® or at any chapter meeting. Renewal dues are accepted each December for the following year. Members need to sign a new application and show proof of national membership. With the purchase of a new Harley-Davidson® motorcycle from Walters Bros. H-D®, Walters Bros. will pay your local membership for the model year of your motorcycle. As soon as you receive your national H.O.G.® packet, please bring in your national card to receive your local card and add your H.O.G.® number to our records. The chapter publishes a monthly newsletter "The H.O.G.® Pen Press" after each meeting. In it, you will find a review of the issues discussed at the monthly meeting and a list of upcoming events. The newsletter will be mailed or emailed to members as requested. The chapter sponsors a H.O.G.® Hotline to update members on upcoming events. The hotline is updated with event reminders, details of upcoming rides, and any last minute changes to an event or meeting. The Hotline phone number is (309)366-1111.